Waves start at 10:00 a.m.
3.5 Mile obstacle course race with mud, woods, walls, and swamps. Participants will start at the UMaine Recreation Center and run up the hill and into the University woods. In the woods, they will encounter crawls through the mud, tire obstacles, climbing over a wall, wading through a swamp, carrying pumpkins, dodging zombies and more. The race will begin at the New Balance Student Recreation and Fitness Center on the University of Maine Campus located in Orono, ME. Waves of 60 people will be sent out every 10 minutes. Waves will be assigned on the day of the race, first come, first served basis. All participants must sign a waiver and be at least 14 years of age. Participants under 18 must have a parent or guardian sign the waiver and be present on race day. Fill out BBA Waiver 2018 prior to race day or at bib pick-up. Please expect to get down and dirty so wear clothes you don’t mind getting muddy. The field is limited to 350 runners. If registration is available on race day, the registration fee will be $25 for UMaine students and $50 for non-students. This race usually fills, so register early. Registered participants will be receiving race instructions via e-mail a few days prior to the race. Race waivers will be required on race day signed by adult 18 or over. Runners will receive a unisex-sized performance t-shirt with their paid registration. Shirts can be picked up on race day at the packet pick-up table located at the UMaine Recreation Center. Shirts will not be mailed or kept for no-show racers after the race day. Race refunds and transfers are not available. In an effort to be green we will only offer pre-race online registration through RaceWire. Day of registration will be at the UMaine Recreation Center starting at 8:30 a.m. and ending at 9:30 a.m. or when the race reaches capacity. Race day registration is $25 for students and $50 for non-students. Students must provide a valid student ID number. Rates before race day are $40 for non-students and $20 for UMaine Students. If the race does not fill, race day registration will be available starting at 8:30 am at the Recreation Center. Race day registration is $25 for students and $50 for non-students. To register click here or head to blackbearattack2018.racewire.com. You will pick up your race packet with your race bib and chip timer after you turn your waiver on the day of the race. Packet pick-up will begin at 8:30 am. How do the race waves work? The first 50 people will start the race at 10:00 am, the waves will continue in 60 person increments every 10 minutes until all participants have gone. Please wear appropriate footwear, YOU WILL GET DIRTY! so wear clothing you do not mind getting dirty, a fierce attitude, and a smile! There will be a water station on the course and food and drinks available for Attackers at the end of the race. There will be awards for the overall winner, and the fastest team group/individual. 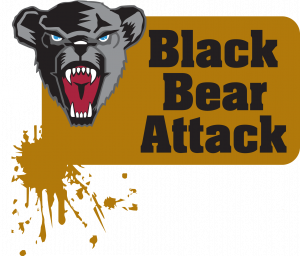 The race is capped at 350 participants and all 350 attackers will get a Black Bear Attack Adventure Race performance T-Shirt. There will be food, drinks, and music at the end of the race. Photos from the race will be available after the race on our facebook page. If you would like to volunteer for the Black Bear Attack Adventure Race please click here to go to our sign up form or contact us at 581.1423. This race is non-refundable and will not be canceled unless the weather is severe. The race will begin at the New Balance Student Recreation and Fitness Center. The race course will be throughout the UMaine forest trails behind the Rec. Center. On various spots on the course, there will be adventure challenges and obstacles. These can include but are not limited to: wall climbs, mud crawls, balance walks, tire obstacles, belly crawls, etc. The race will be timed using a chip timing system. All participants must sign a waiver and be at least 14 years of age. The distance is approximately 3.5 miles through the woods and trails at UMaine. Race Results 2011– These have been updated!